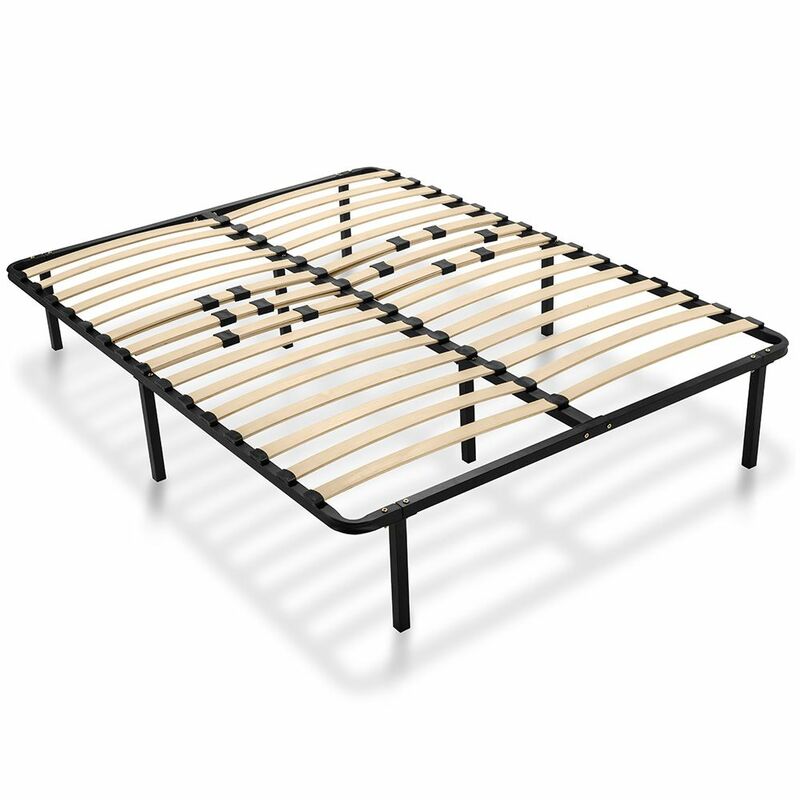 Comfortably cambered wooden slats provide firm but flexible support for your mattress—no box spring required. These platform bed frames feature sturdy steel construction with comfortably sprung wooden slats to support your mattress. Since no box spring is needed, you get a full 12'' of vertical height under the bed for storage. 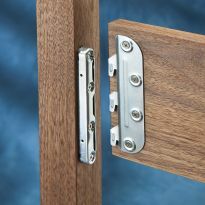 The reverse camber of the slats, paired with the center support leg, minimize the possibility of sagging. 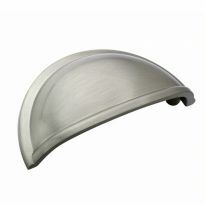 In addition, six double slats are provided for extra support wherever it is needed. 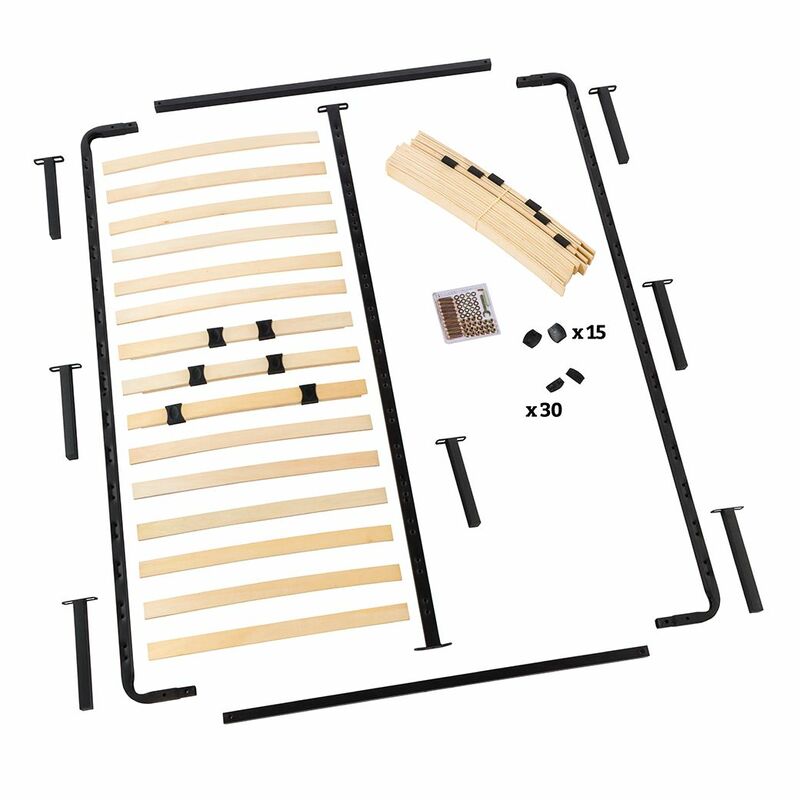 The mattress platforms may also be used with the I-Semble Platform Bed Lift Mechanisms (sold separately) for easier access to under bed storage. Complete assembly instructions are included. Twin Weight Capacity (Static Load): 360 lbs. Full Weight Capacity (Static Load): 550 lbs. Queen Weight Capacity (Static Load): 650 lbs. Went together perfectly. Even had a few spare pieces leftover. Highly recommended. 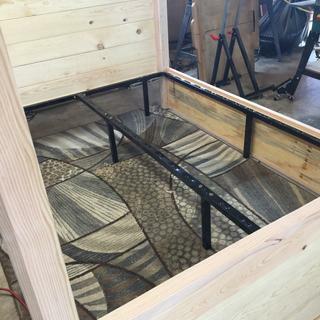 I used it only with the center leg as a part of a bed frame I built. I purchased this bed frame last month and only got around to assembling it yesterday (3/3/18). Easy to assemble, although the instructions paper was not all that hot. But it was easy to figure out. I've been sleeping on a queen mattress on the floor for several months. I'm old (71), so it was nice to have support beneath the mattress for a change. And to get up was so much easier. The dogs and cat love it, too! I-Semble was easy to put together, and my daughter seems to like it. Strong, easy to assemble, and comfortable! This is a well constructed and sturdy square frame. 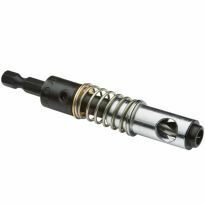 The hardware is very good quality. 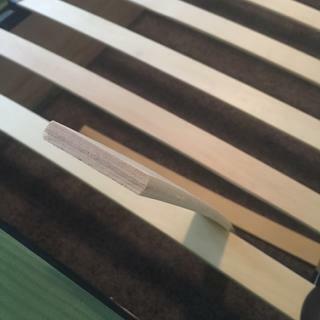 The plastic brackets that hold the slats in place are good, although a little challenging to pop into place, but that helps make sure they stay put once inserted into the frame. The curved wooden slats are three layer flexible plywood. We only had a mattress (and had been sleeping on the floor... fine for me, but she likes more cushion), so the frame provided just the right give under the mattress for us. I appreciated the double slat feature as I like a bit more firmness to the mattress than my wife. 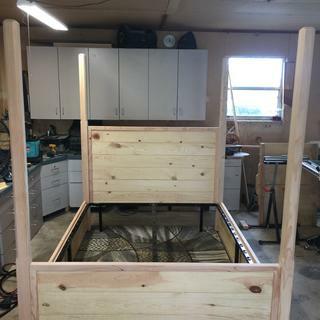 I used the frame as the main support for a quick pilot bed project (see pics....all pine... one of these days I'll use the same design in cherry). All wood pieces were attached by drilling screw holes through the square frame (not difficult). Posts were simply attached to the side rails and headboard/footboard, although I could have screwed them to the frame as well. Overall, I would highly recommend this frame. I did not sleep on it alone, but don't doubt it provides a stable bed frame without the added woodwork. Hoping the underbed storage is a plus on a durable platform bed, yet the mattress won't be so tall when getting in and out of bed since the platform negates the box spring. Can I purchase the black plastic brackets that hold the slats (30 single sided ones and 15 double sided ones, which you normally supply with each bed)? Some of my pieces have broke. What kind of wood and dimensions are used for the slats? BEST ANSWER: One of the reviews says that the slats are three layer flexible plywood. 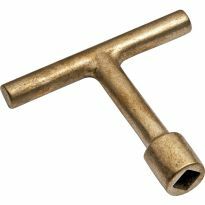 Is the frame round or squake tube? What dimension? How are the joints secured? Can casters be added? BEST ANSWER: One inch square tubes. Dimension (on Queen) is accurate as described. 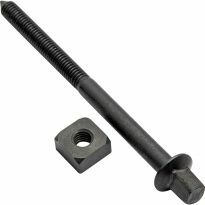 Joints are secured with the included lag bolts and are very good quality. Not sure about the castors... the legs have plastic "feet" snapped into the square steel tubing. You'd have to pull those out, then find casters that fit into the steel tubing. What is the width and length dimensions of a queen size bed frame? 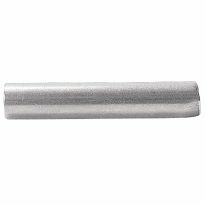 BEST ANSWER: The described size is true: 59-1/2'' x 79-1/2''. Queen mattresses are typically 60x80. Can this be used without the legs as an insert in a wall bed frame? How tall are just the perimeter frame and slats? BEST ANSWER: I didnt use the legs except for the middle post. I used a full size mattress which is 53 1/2 x 74 1/2 . I used the lift mechanism which I feel should have been dropped down at least another inch so you dont see the metal frame. I also had to install a board on the foot board to hold the mattress even around the bed. I would say yes. While I'm not at home, the perimeter frame is about 1". The slat mounts add about 1/2". The slats curve upward another 2-3". Does any one know if a head board can be attached to this frame? BEST ANSWER: Its not designed for a headboard (does not have brackets to attach to headboard posts as with traditional bed frames). 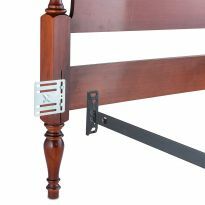 Nonetheless, the square steel frame is not difficult to drill through and attach to a headboard, although not at the posts. I’ll upload pics later today that show what I build around the frame. I drilled holes through the frame to attached a headboard. What is the spacing between the slats? Can the spacing be changed? I need less than 3 inch slat spacing. 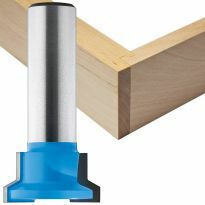 BEST ANSWER: About the only way you're going to get less than 3" slat spacing is to purchase two kits, drill extra holes for the holders, combine the slats of both frames. I'm just curious to know why you need narrower spacing. I weigh about 175, and the spacings work for me. I'm quite satisfied with the product. Good Luck! Oh, okay, I kinda-sorta understand, now. Not your weight but the mattress construction. Never would have crossed my mind. Again, Good Fortune to you! Spacing can not be easily changed. Slats are 2 1/16 inches wide. Slats fit into plastic pockets attached to side and middle rails . Spacing between assembled slats is 2 5/8 inches. The spacing is 2 3/4”. Not changeable. The comfort exceeds the box springs this frame replaced. It’s been a year and still as good as day one. The spacing is about 3 1/2 inches in between the slats, and no the spacing cannot be changedEnter an answer to this question. BEST ANSWER: If you are referring to a Murphy-style bed, I don't see why not. The slats are held in place by tabs on either end of each, so unless a tab has come loose, there shouldn't be a problem. I would think so. 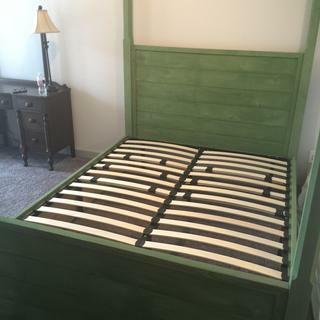 I used just the slats and the metal frame without the legs in a platform bed I made. Solid metal frame. I am planning for a king size bed. Can I use 2 twin platforms to make the support base? BEST ANSWER: You should be able to locate them side by side. They stand alone as structurally sound. Use all the support legs. Then it's just a matter of the width dimension of two twins vs. one king. A king size mattress is 76" wide. Putting two twin platforms together gives you 77.5". 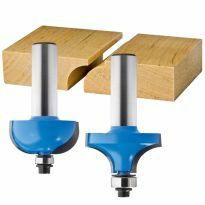 The frame drills through easily so bolting two frames together would be simple. For the twin size, are there really 2 sets of slats separated down the middle with the metal brace? Seems like a bad design to have the middle of the mattress sag? BEST ANSWER: I bought a full size frame for my daughter so I don't sleep on it but I have laid down on the bed and I can't tell. I plan to buy a King size frame for my wife and I when we move and I build a new bed for us. Do you make this in a short queen size that could be used in RV's that have platform beds? 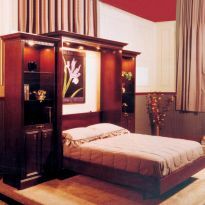 BEST ANSWER: This Murphy Bed is not currently available in King size.